His connection to Ajax, his hometown club, is — if not unique — then certainly of rare fascination. It is an inextricable link that extends well beyond 250 goals in 318 games, well beyond three consecutive European Cups and even beyond three years as manager in the late 1980s. Alongside the physical tangibility of Cruyff’s achievements sits an iconic untouchability that places him as an integral figure in all that Ajax represents. In today’s world, most clubs would claim to possess a philosophy of some kind, but there are few with a culture so deep-rooted and widely recognized. 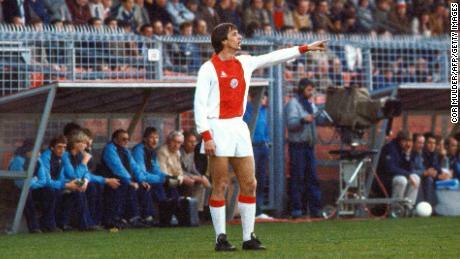 Cruyff is the common denominator — both at Ajax and, arguably, at Barcelona. “If you look back, you can’t talk about his importance,” David Endt, Ajax’s general manager between 1997 and 2013, tells CNN. “It’s much more than that. He is the trademark of our club. He showed in his game, with his ability, everything which is Ajax — the daring, the offensive way of thinking about football. 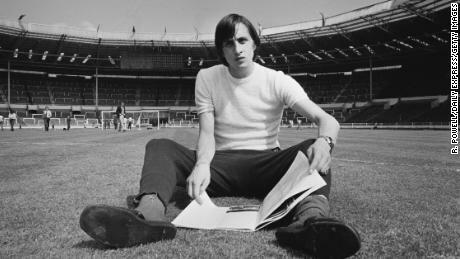 Two years after his untimely death in 2016, the club’s Amsterdam Arena was renamed the Johan Cruyff Arena in tribute. Ajax’s tactical system — its famed 4-3-3 formation, complete with an emphasis on possession, attacking down the wings and self-development, is entrenched in the club’s “total football” history — a method first explored by Rinus Michels, who managed a young Cruyff during the 1960s. Endt’s perspective is shared by former Ajax goalkeeper Edwin van der Sar, who is now the club’s chief executive. Van der Sar’s rise through the club’s ranks from joining as a 19-year-old to becoming the off-field figurehead is indicative of Ajax’s commitment to retaining the roots first planted in the all-conquering era of Cruyff. In a sense, Ajax’s inherent principles may well have been best highlighted in 1995, when the club secured a fourth European title by beating AC Milan. More than two decades after Cruyff’s hat-trick of triumphs in 1971, ’72 and ’73, it was proof that Ajax’s methods still worked. Nine of the 16-man squad for the final had made their professional footballing debuts at Ajax. The starting line-up alone featured Van der Sar, Ronald and Frank de Boer, Frank Rijkaard, Clarence Seedorf, Edgar Davids and Marc Overmars. Patrick Kluivert came off the bench to score the winner. It was a who’s who of Dutch footballing royalty. Danny Blind, who would go on to lead the club’s academy and manage the first team, captained the side. For him, however, it was Jari Litmanen who made the team tick. In effect, the Finnish playmaker had replaced Dennis Bergkamp in the number 10 role pivotal to Ajax’s gameplan. He recalls the final as a culmination of what had come before it; he looks back on a 5-2 semifinal victory over Bayern Munich as the aesthetic pinnacle. The final — a tense affair against a side including Paolo Maldini, Marcel Desailly and Franco Baresi — was the third time that the two sides had met in the 1994/95 competition, with Ajax winning the previous two. “It was not a good game. I don’t want to say it was boring because it’s a final,” adds Blind. “There’s all kind of things around, and the crowd was unbelievable. But it wasn’t a game like Munich or one of the great games. The decision to rely on a young homegrown prodigy is symptomatic of the club’s longstanding ethos. Even in Cruyff’s first European Cup win in 1971, he was surrounded by lifelong fans; Sjaak Swart is the club’s record appearance-maker, while left-winger Piet Keizer only ever played professionally for Ajax. The reaction of the Ajax faithful, perhaps, speaks to the club’s culture better than most. As Blind and Van der Sar share their memories of the aftermath, they do so in vivid fashion — as only fans themselves could do. In Van der Sar’s office sits a photo of his 1995 Champions League-winning side celebrating on a barge. There are fans jumping into the canal to be with their heroes. It is an image that speaks immeasurably of Amsterdam and of Ajax. Van der Sar — his photo acting as a daily reminder — recalls the celebrations in the city’s Museumplein, a huge public space surrounded by three museums.